About 1620 the East India Company established another factory at Masulipatam on the eastern side of India. The Hindus along the coast of Coromandel were famous for painting muslins and calicoes, and there was a growing demand for such goods amongst the eastern islands, whilst valuable cargoes of nutmegs and other spices could be obtained in exchange. But Masulipatam was seated in Mohammedan territory. A Sultan of the Deccan, reigning at Golconda, had extended his dominion eastward to the coast of Coromandel, and established the port of Masulipatam for the importation of horses from the Persian Gulf. The traders at the British factory were therefore cramped and worried by the Mohammedan authorities, and yearned to effect a settlement on the territories of some Hindu Raja further south, where they could fortify a factory and mount it with British cannon without the interference of local authorities. British territory and fortress at Madras, 1639. §3. In 1639 a British merchant named Day bought a strip of territory on the Coromandel coast, about 300 miles to the south of Masulipatam. It was within the dominions of a Hindu Raja, and was about six miles long and one mile inland. It included a small island, which faced the sea and was defended on the land side by a river. Mr. Day agreed to pay the Raja a rent of 500/- a year in native coin known as pagodas, and the transaction was duly engraved on a plate of gold. A factory of brick was built upon the island, and mounted with cannon, and called Fort St. George. The Raja was perfectly content. He was too glad to get a rent of 500l. a year to raise any difficulty as regards fortifications or cannon. Fort St. George and Black Town. This factory was the germ of the city of Madras, on the coast of Coromandel. Weavers, washers, painters, and hosts of other Hindu artisans, flocked to the spot and eagerly entered the service of the British, and began to set up their looms and to weave, wash, and paint their cotton goods in the open air beneath the trees. Villages of little huts of mud and bamboo soon grew up on the sandy soil to the north of the island and factory. Each avocation formed a caste, which generally had its own quarters and its own headman. In this manner a Hindu settlement grew up by the side of Fort St. George and was known as Black Town; and the whole locality, including Fort St. George and Black Town, was called Madras, and was the first territory acquired by the East India Company in India. Four miles to the south of Fort St. George was the Portuguese town of St. Thomé; but the Portuguese were now friends with the English. Their power was being overshadowed by that of the Dutch, who had founded a town and fortress at Pulicat, nearly thirty miles to the northward of Fort St. George. The Dutch settlements in India were the outcome of the hostility of Spain. For centuries the Dutch had been the carriers of Europe, from the Mediterranean to the Baltic. In the period which preceded the sixteenth century they had bought Indian commodities at Genoa, Naples and Venice. After the Portuguese established a trade in India, the Dutch went every year to Lisbon to buy Indian commodities for the European markets. In 1580 they threw off the yoke of Spain, and founded the United Provinces. That same year Spain and Portugal were formed into one kingdom under Philip II. In an evil hour for Portuguese interests in India, Philip thought to punish the Dutch by shutting them out of Lisbon. The Dutch revenged themselves by sailing round the Cape and buying what they wanted in the islands of the Eastern Archipelago. In 1600 they built a factory in Java, which grew into the city of Batavia. In 1610 they built a square fort on the Pulicat Lake, which grew into the town of Pulicat and threatened to become the capital of Dutch ascendency in India. The Indian quarter at Madras was almost entirely Hindu. Scarcely a Mohammedan took up his abode within the Company's bounds. Accordingly one of the earliest acts of the President and Council was to divide the streets of Black Town into those of the right and left hand. All over Southern India, the lower castes of Hindus are divided into Right and Left Hands, and yet no one can account for the distinction, or satisfactorily define the respective rights of each Hand. The so-called Hands are, however, intensely jealous of each other. For generations each Hand in the towns of Southern India has had its own streets and its own pagoda. At Madras, if one Hand passed in religious procession along the streets of the other Hand, or if the members of one Hand chanted Hindu hymns or mantras before the pagoda of the other, a fray would break out in Black Town, which could only be suppressed by British soldiers, and then would be followed by a strike of weavers or painters, or the flight of all the members of one Hand to the Portuguese settlement at St. Thomé. These conflicts, which more than once brought the settlement to the brink of ruin, reached a climax in Governor Pitt's time, as will appear hereafter. Meanwhile, the country round about Madras was in a state of turmoil. The Mohammedan army of the Sultan of Golconda was advancing against the Hindu Rajas of the south, and formed a camp in the neighbourhood. The Raja who had sold the territory to the East India Company fled away to the interior, and was never heard of more. The Mohammedan army captured the Portuguese town of St. Thomé, dismantled the walls of the fortress, and carried off the cannon to Golconda; and they would have treated Fort St. George in like fashion, had not the British stoutly resisted, and quieted the Sultan by engaging to pay him the rent which they had previously paid to the Raja. Troubles with Dutch and French, 1670. About 1670, or some thirty years after the foundation of Madras, the state of affairs was complicated by Charles II. 's unholy alliance with France against the Dutch. A French fleet attacked St. Thomé and drove out the Mohammedans. 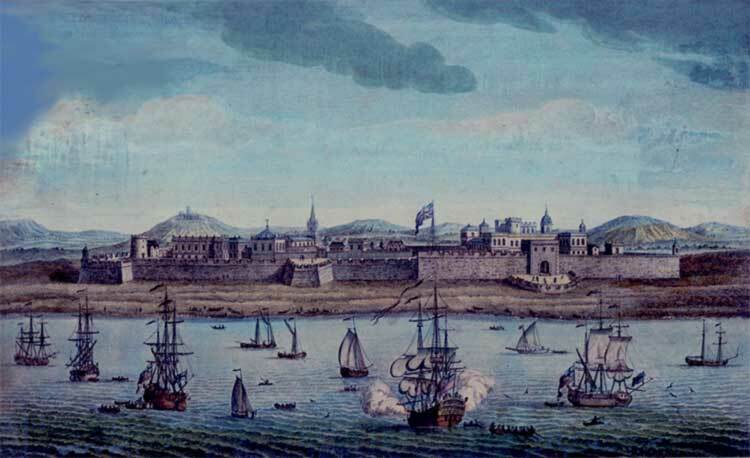 A Dutch fleet from Pulicat recaptured St. Thomé, drove out the French, and restored the place to the Sultan of Golconda. The British settlement was in sore peril; but in 1674 there was peace between Great Britain and Holland, and the danger was over. These troubles brought many strangers to Madras, and the population, white and black, was largely increased. Many Portuguese families from St. Thomé took refuge in Madras, and added to the strength of the European settlement, known as White Town, by building houses under the protection of the factory guns. The British factors and soldiers of the garrison married the daughters of the Portuguese, much to the horror of the English chaplain of Fort St. George, as the marriages were accompanied by numerous conversions of bridegrooms to the Catholic faith. At the same time wealthy Hindu traders and bankers began to build substantial houses in Black Town for the sake of British protection. Many invested their money in trading voyages; some acted as brokers or banyans for the supply of Indian commodities to the Company's servants; others bought European goods at the public auctions, and supplied the native dealers up country. §4. Within forty years of the building of the British factory, Madras was the pride and glory of the East India Company. Fort St. George, or White Town, was a European city in miniature. The primitive factory in the centre was replaced by a stately mansion with a dome, which was known as the Governor's House, but included a town-hall, a council-chamber, and sundry offices. It was seated in an open square, having a strong wall along each of its four sides, guards' houses, and bastions at each corner mounted with cannon. Outside the fortification were little streets, paved with pebbles, containing about fifty European houses. There was also a Protestant church for the English inhabitants, and a Catholic chapel for the Portuguese residents. The whole of White Town was environed by an outer wall, sufficiently fortified to keep off an Indian army. None but Britons, or Europeans under British protection, were permitted to reside in White Town. The garrison consisted of two companies of European soldiers, and a large number of native guards, who were known as peons. Hindu town under British rule. At this time the population of the native town was estimated at 300,000 souls, but was probably half that number, and an attempt was made to introduce something like a representative government. Whenever the Governor and Council desired to know the wishes of the people generally, or to act with their consent, they summoned the headmen of castes, and consulted them accordingly. Justice, however, was administered by two English gentlemen, who sat twice a week in Black Town in a building known as the Choultry. The Justices of the Choultry tried all offences and disputes amongst the Hindus, and fined, flogged, or imprisoned at discretion. The old English punishments of the stocks, the pillory, and the gallows were also in full force in Black Town, but no Hindu was executed without the confirmation of the Governor and Council. The Justices of the Choultry were bound by no code of laws; they were simply instructed by the Directors of the Company in England to decide all cases, civil and criminal, according to "equity and good conscience," guided by English law and their own experiences of Hindu customs and usages. A Hindu superintendent of police was appointed under the title of "Pedda Naik," or "elder chief;" and he was bound to maintain a certain number of constables known as peons, and keep the peace of the town. He was expected to prevent theft and burglary, and either to recover stolen property, or to pay the value to the owner. In return, the Pedda Naik was allowed to cultivate a few fields rent free, and to levy a small octroi duty, or toll, on articles of Hindu consumption. The main difficulty at Madras was to keep the peace between the European soldiers of the garrison and the Hindu population. Any European soldier who remained outside the Fort at night time was set publicly in the stocks for a whole day. Any European who attempted to get over the Fort walls, was imprisoned in irons for one entire month, and kept on rice and water. Any soldier who threatened to strike a Hindu was whipped. Any European who took an article out of a shop or bazaar, under pretence of buying it at his own price, was sentenced to pay treble the value to the party aggrieved. Another difficulty was to keep the streets of Black Town clean and wholesome. The Governor and Council summoned the heads of castes, and proposed to levy a small tax on every house. The heads assented to the measure, but offered to carry out the work themselves, and to raise the necessary funds in the same way that they levied contributions from their respective castes for defraying the cost of public festivals. All this, however, was a blind on their part to delude the British Governor and Council. Nothing was done by the heads of castes, no money was collected, and the streets were dirtier than ever. Contumacy of heads of castes. Meanwhile Madras was threatened by the Sultan of Golconda, and the Directors in England instructed the Governor and Council at Madras to build a wall round Black Town, and meet the cost by levying a small ground-rent from each householder. In this case no difficulty was anticipated. The Hindus might ignore the importance of sanitation, but they could scarcely refuse to contribute towards the defence of their lives and property, to say nothing of their wives and families. The heads of castes, however, raised strong objections, but found that the Governor was bent on carrying out the orders of the Court of Directors. The heads of castes were told that the rents must be paid, and that those who refused to pay must be prepared to sell their houses and leave the British settlement. At this threat they all promised to pay, but secretly prepared for a general uprising. Suddenly, one Sunday morning, the 3rd of January, 1686, it was known in Fort St. George that the Hindu population of Black Town were rebelling in Asiatic fashion. Under the orders of the heads of castes, the Hindu servants of the Company had thrown up their duties, bazaar dealers had shut up their shops, and provisions and grain were kept out of the town. The Governor in Fort St. George sent a detachment of the British garrison to guard the entrances to Black Town and suppress the tumult. Proclamation was made by beat of drum that unless the heads submitted before sunset, their houses would be pulled down on the following morning, the sites sold by auction, and the rebels and their families banished for ever. Hindus who failed to return to their duties would be discharged from the Company's service; dealers who kept their shops closed would be heavily fined and all their goods confiscated. These peremptory orders had the desired effect. The heads of castes seemed to be completely cowed. Before sunset they appeared at the Fort and begged pardon for their rebellion, and were told to put an end to the tumult in Black Town. Next morning the heads of castes returned to the Fort and presented a petition, begging to be relieved from the payment of the ground-rent. Each man was asked in turn whether he would leave the town, and each in turn said that he would submit, and then the whole body declared with one voice that they would not pay the tax. Proclamation was at once made by beat of drum that the orders of Sunday would be immediately put in execution. The Hindus bent to the storm. They saw that they were at the mercy of their British rulers. The shops were opened, provisions were brought into the town, and all the artisans and servants of the Company returned to their duties. The ground-rents were collected without demur, and later on the scavenger-tax was raised without difficulty. Mayor, aldermen, and burgesses, 1688. §5. When the news of these disturbances reached England, the Directors in Leadenhall Street, or rather their once celebrated chairman, the great Sir Josiah Child, devised a scheme for rendering municipal taxation acceptable to the native population. A charter was obtained from James II. for founding a corporation in Madras, consisting of a mayor, twelve aldermen, and sixty burgesses; but it was suggested by the Court of Directors that the heads of Hindu castes, as well as Britons, might be appointed aldermen and burgesses, and it was hoped that the corporation would be willing to tax themselves and the inhabitants generally, for keeping the town clean, improving the public health, building a guild-hall and hospitals, and establishing schools for teaching the English tongue to Hindus, Mohammedans, and other Indian children. Before the Governor and Council at Madras could offer a single suggestion, they received instructions cut and dried. The mayor and three senior aldermen were always to be covenanted British servants of the East India Company, and they alone were to be Justices of the Peace. The remaining nine might belong to any nationality, and included Portuguese, Hindu, and Jewish merchants having dealings with the Company at Madras. Thirty burgesses were named in the charter, but they were all Englishmen; and the remainder were to include the heads of all the castes, so as to induce the whole of the Hindu inhabitants to contribute cheerfully to the public works already specified. The mayor and aldermen were to wear red silk gowns, and the burgesses white silk gowns, and maces were to be carried before the mayor. In a word, all the paraphernalia of an English municipality in the seventeenth century were sent to Madras to be adopted by the new corporation. The new municipality was inaugurated with much pomp and ceremony in 1688, the year of the glorious Revolution. The Governor of Madras was outside the corporation, but the mayor and three senior aldermen were members of council. On Saturday, the 29th of September, 1688, the Governor received the mayor, aldermen, and burgesses in the council-chamber at Fort St. George. The members of the new corporation then took the oaths and sat down to a corporation dinner; and after a while they all marched to the town-hall in their several robes, with the maces before the mayor. Nothing, however, is said about the heads of castes, and nothing more about the burgesses. The mayor and aldermen were to be a Court of Record, with power to try all causes, criminal and civil, in a summary way, according to "equity and good conscience," and such laws and orders as might be made by the Company. The corporation were authorised to levy taxes for building a guild-hall, a public jail, and a school-house for teaching English, arithmetic, and merchants' accounts to Indian children, and for payment of the necessary salaries. Henceforth, two aldermen sat as justices of the Choultry; but the corporation raised no tax and founded no institution, and eventually died out from sheer want of vitality. The authorities for the present chapter, which deals with the rise and early development of British rule in India, are somewhat numerous. The most important are the Government records at Madras, in which the weekly transactions of the Governor and Council are entered at full length in a series known as "Consultations." Every year a copy of the "Consultations" was sent to the Court of Directors, together with a summary of the affairs of the year as a "General Letter;" and every year a "General Letter" was received from the Court of Directors, reviewing the "Consultations," and conveying instructions and orders thereon. The Madras records have been closely investigated by the author from 1670 to 1748; and printed extracts were published at Madras in 1860-62, in three volumes small quarto, under the title of Madras in the Olden Time. To them may be added Bruce's Annals of the East India Company; Sir Thomas Roe's Journal of a Mission to the Great Mogul in 1616-18; and the travels of Pietro della Valle, Tavernier, Thevenot and Fryer; as well as Orme's History of Hindustan, Stewart's History of Bengal, Faria y Souza's History of Portuguese Asia, and Shaw's Predecessors of the High Court at Madras. Further authorities will be found cited in the author's History of India from the Earliest Ages, and in his Early Records of British India. The Mofussil Courts, and the High Court in Appeals from the Mofussil Courts, are still required to decide, according to "equity and good conscience." See the "High Court amended Charters" granted in 1866.